Parkinson’s disease is a degenerative brain condition that affects many elderly people worldwide, making it hard for them to communicate or carry out daily tasks without help from Oshkosh, WI, live-in caregivers. This condition is characterized by tremors, difficulty moving, and dementia. These symptoms often prevent seniors with Parkinson’s from being able to communicate with their doctors and receive adequate treatment. Thankfully, researchers have found a way to overcome this problem. The Personal KinetiGraph is a data logger that looks like a small wristwatch and will help doctors provide optimal treatment for seniors with Parkinson’s. 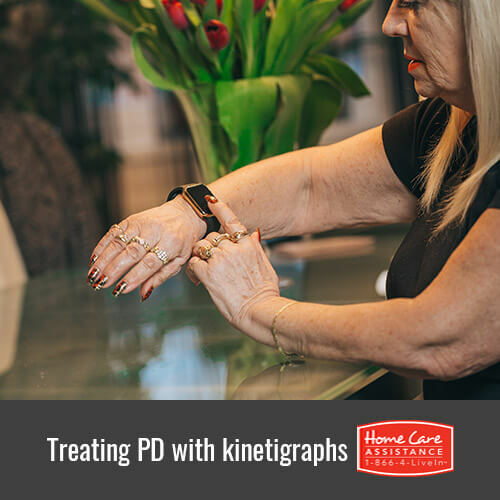 The Personal KinetiGraph is a small device that can be easily strapped to a patient’s wrist with or without help from a trusted Oshkosh, WI, senior care provider. Every two minutes, it takes a reading that tracks the movements of the wearer. This device can log all of the tremors, shaking, muscle contractions, and twitching that people with Parkinson’s experience on a daily basis. It also has a button that wearers can press to track when they take their PD medications. It can store up to ten days of data at a time and provides a comprehensive look at everything a Parkinson’s patient experiences. How Can This Treat Parkinson’s? Often times, doctors have trouble creating a good treatment plan because they do not have adequate information about their patients. This is because seniors with Parkinson’s may have trouble remembering or talking about their symptoms. The researchers who created the Personal KinetiGraph hope that it will help doctors evaluate the effectiveness of medications taken by their patients. It will allow the doctors to notice trends and patterns associated with movements in order to create the right treatment for each individual case of Parkinson’s. Clinical trials have shown that the device is very effective at improving doctor-patient treatments. For example, one doctor found that a patient’s medication was not working even though the patient thought it was, which enabled the doctor to prescribe a better medication. Give your loved one the chance to manage PD symptoms at home with help from a reliable home care agency like Home Care Assistance of Oshkosh. We provide flexible services such as Parkinson’s, Alzheimer’s, and post-stroke home care in Oshkosh, WI, which enables seniors to safely manage symptoms in the comfort of home. In addition to safety monitoring, our expertly trained caregivers offer medication reminders, transportation to and from appointments, and mobility training. When we help with these and other aspects of home care, it boosts your loved one’s self-esteem and wellbeing. Call us at 920-710-CARE (2273) today to learn more about our comprehensive services and schedule a complimentary consultation over the phone.